Afordable hand made sculptuer for unique gift giving. Sculputural hands, dogs, boats, houses and more, to express the joy of living. 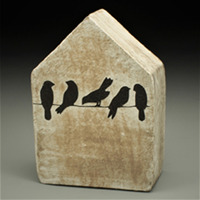 Cathy Broski "Birds on a Wire"
Each stoneware house is made to hang on the wall or sit on a shelf. 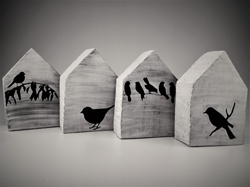 Each stoneware house is made to hang on the wall or sit on a shelf. Using a paper steciling technique with slips a dramatic image is reviled. Cathy Broski "Dogs at Play"
This dog is modeled after Cathy's own beloved dog, who was a rescue. 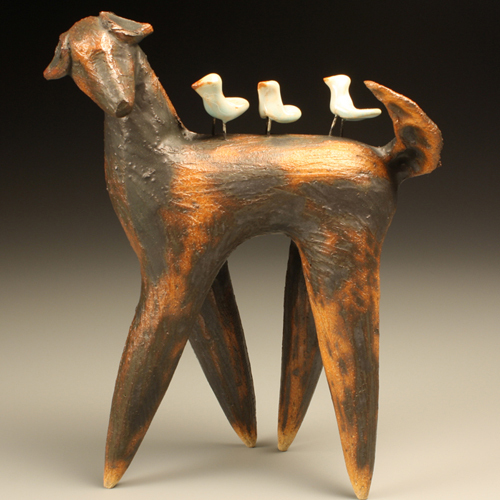 Each dog is assembled from clay cones and cylinders. The surface is textured, glaze is applied and then selectively wiped to create a worn look. This dog is modeled after Cathy's own beloved pet, Porter, who was rescued by her husband on Valentine's Day.Each dog starts as a series of clay cones and cylinders. As they are assembled, the pose emerges. The surface is smoothed then textured. After the first firing, glaze is applied and then selectively wiped away to create a worn look. Cathy Broski "Deep set Wall Tiles"
Deep-set tiles available in 5 shapes, 5 colors, and 21 images Fashioned after doorways, windows, and shrines. Each from original molds made by the artist. The center image is individually made. Deep-set tiles available in 5 shapes, 5 colors, and 21 images. Fashioned after doorways, windows, and shrines. Each is pulled one at a time from original molds made by the artist. 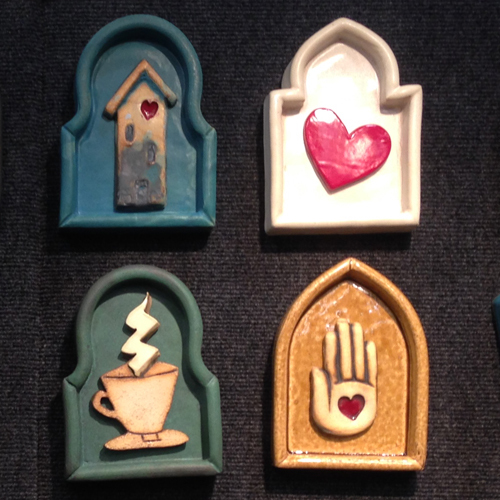 The center image is individually made and placed in the tile after both are glazed. 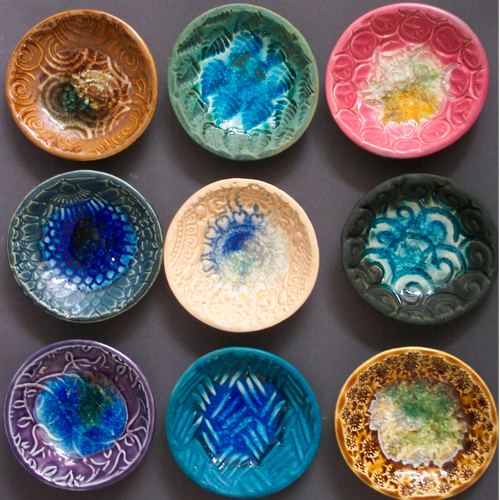 The artist presses a slab onto her original texture tile, forms it into a bowl, glazes it. Recycled glass is added to melt into a beautiful prismatic surface. Not all colors and textures shown. Catch the sun or jewelry in a charming individually crafted jewel bowl. Safe for dry foods. The artist presses a slab onto her original texture tile, forms it into a bowl, glazes it. Recycled glass is added to melt into a beautiful prismatic surface. Order by the dozen, no two alike. Not all colors and textures shown. Each Hand is cut from a thick slab of clay. When the clay becomes firm the details are carved to form fingers and folds. Glaze is applied and selectively wiped away to reveal a worn look. Each is unique and will vary slightly. 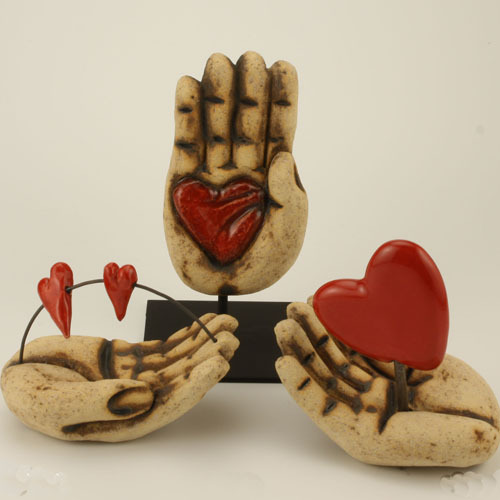 Each Individually Carved Hand is cut from a thick slab of clay and formed into a general shape. When the clay becomes firm the details are carved to form fingers and folds.